Usually I spend months thinking about something before I write down what is on my mind, but today I'm working right in the moment. This fine Sunday morning I sat down to read The New York Times. 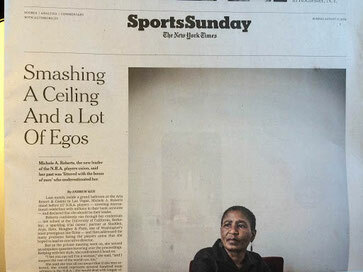 "Smashing a Ceiling and a Lot of Egos"
Michele Roberts, N.B.A. the new leader of the N.B.A. player's union, said her past was "littered with the bones of men" who underestimated her. I know that one of my hot button topics is the treatment of women and what they need to do to obtain respect and perhaps I'm a little sensitive to this, but it seems glaringly obvious that Roberts made an awesome feminist statement in her original quote and the NYT completely (either intentionally or through gross ignorance) missed the point when they paraphrased her for the byline. In fact, they took an observation of what women have to face in a male-dominated world and turned it into a macho aggressive statement that their sports section reading audience could relate to. I guess it's a good way to get the reader's attention, so I shouldn't be too surprised. I am still not a happy Tess for a few minutes this fine Sunday morning.